There is an old wives tale that if you heat up a metal spoon and place it against a bug bite or sting the wound won't itch or be sore. Turns out that piece of advice may actually be more fact than fable. Clinical research has shown that the saliva and venom from the insect stings and bites of mosquitoes, flies, bees, wasps, and ants is thermolabile -- meaning these compounds that are causing the irritation to your body break down when exposed to heat around 120° Farenheit. A company called Maxogen Group LLC recently reached out to me about testing out their new product which based upon this principle utilizes Thermo-Pulse-Technology to alleviate the pain and itching caused by insect stings and bites. 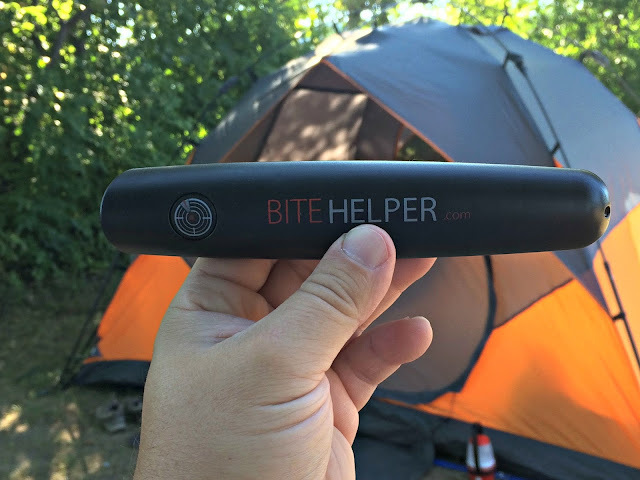 While initially being a bit skeptical of the gadget, I knew with a family camping trip coming up there probably would be plenty of encounters with bugs to test it out with during our vacation so I had nothing to lose by them send me a complimentary BITE HELPER - THE ITCH THERMINATOR. On the first day of our camping trip, I took a hike through the nature trails by the campground we stayed at that wind through some marshes and bogs which this time of year are filled with amazing creatures to behold such as dragonflies, green frogs, great blue heron, sandhill cranes, and painted turtles; but are also infested with plenty of mosquitoes. While I had doused myself with Cutter Backwoods Insect Repellent, a few of those pesky critters still took a couple of bites out of me. Returning to my tent, I pulled out the BITE HELPER that had been stashed in the camping gear. Wow! after using THE ITCH THERMINATOR I totally forgot I'd been bitten as there was no more swelling or itching through the remainder of the weekend. 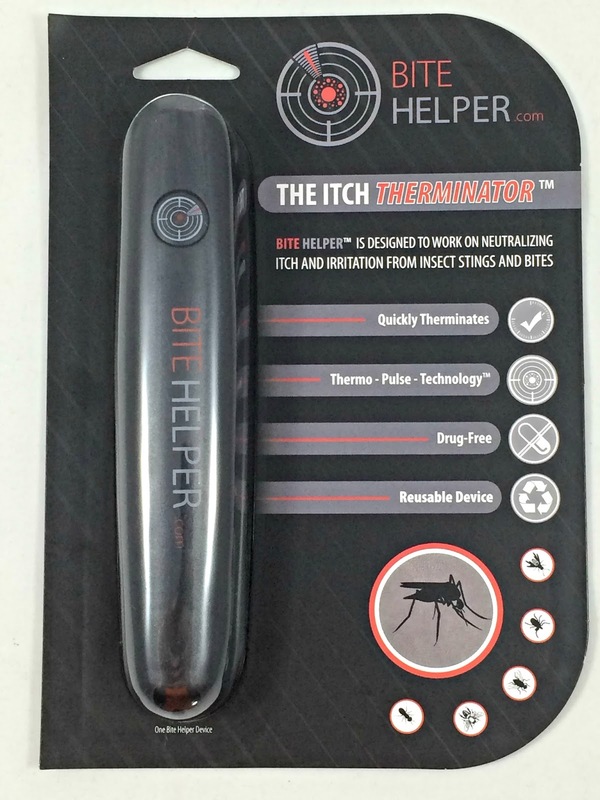 BITE HELPER - THE ITCH THERMINATOR really worked! Later that day while swimming at the campground lake my son was stung by a wasp. I pulled back out our BITE HELPER - THE ITCH THERMINATOR and the swelling around his wound noticeably improved plus he didn't complain about itching or any discomfort from the sting during the rest of our camping trip. That is very uncharacteristic of him! You'd think a wasp sting would put a huge damper on his fun but other than some redness around where he was stung you'd never know the incident occurred from observing him. When using BITE HELPER - THE ITCH THERMINATOR you will begin to feel a slight vibrating against your skin where the bite or sting occurred when it is first turned on. As the metal circular disc at the top of the device begins to pulsate it will also gradually heat up until it reaches 120° degrees - you'll feel it getting hot but that is necessary for the Thermo-Pulse-Technology to work. Hold it on the spot you were bit or stung for thirty to forty seconds then pull it away. To avoid a potential burn don't keep your skin exposed to the device for longer then 45 seconds. Give yourself sixty seconds for the device and your skin to cool down then repeat. According to the product's website, its Thermo-Pulse-Technology provides therapeutic heat in combination with pulsating waves. The vibrations from the device allow the heat to penetrate deep under the skin neutralizing the insect saliva or venom that have been injected into a body and increase localized blood flow to help clean out toxins reducing pain, swelling and itching. I'm not a medical expert so the ins and outs of the effectiveness of this device are beyond relying on me to explain, but can say that it worked as promised when my family needed it. We'll definitely be keeping it around so that it is handy to use in situations where bug bites and stings could present themselves. Having a daughter with severe food allergies, I understand how dangerous an allergic reaction to an insect sting or bite can be for someone. This product is NOT a remedy for an allergic reaction and should not be considered as treatment for one. If you are allergic to insect stings or bites get appropriate medical help immediately! Also note that scorpions and spiders aren't insects -- they're arachnids. Arachnid venom and saliva hasn't shown the same thermolabile properties as that of insects so BITE HELPER is not intended to treat stings or bites from spiders or scorpions. It also isn't effective for bites from snakes or any other poisonous animal either. 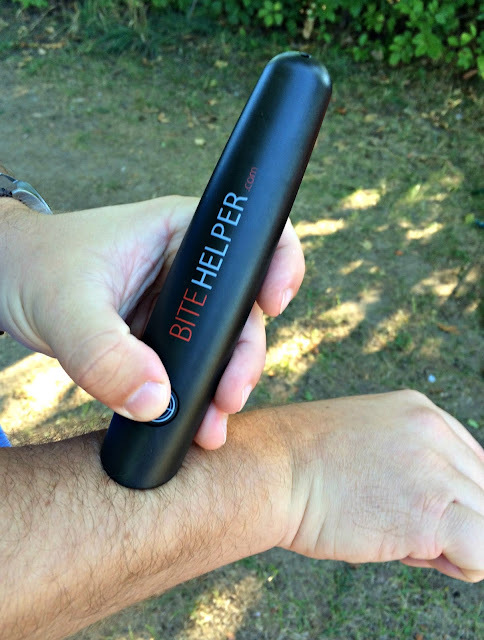 If you don't want to deal with the nagging scratching and itching that comes with insect bites and stings, a BITE HELPER is a nice gadget to keep handy. It is small enough to fit in the palm of your hand making it easy to store at home or take along with you when traveling. Easy to use it only takes 2 AA batteries and the push of a button to operate. Hopefully your experience using it will be as good as mine was! 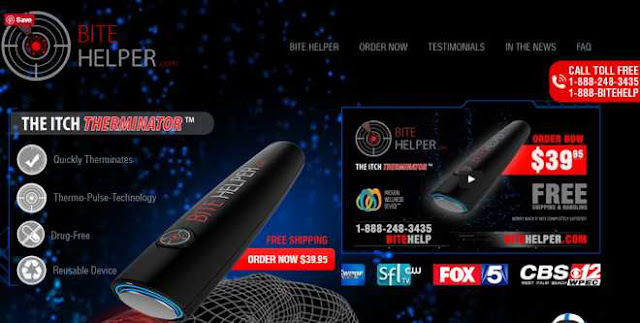 For more information or to purchase your own BITE HELPER: THE ITCH THERMINATOR visit www.bitehelper.com. The opinion expressed in this review is honest and my own. I was under no obligation to write a review. A Geek Daddy's policy is if we have a negative experience with an item provided for a review a blog post won't be published. I received a complimentary product to utilize for this review but did not receive any financial compensation.